The Story So Far… » Blog Archive » The Curse Of Gentrification! 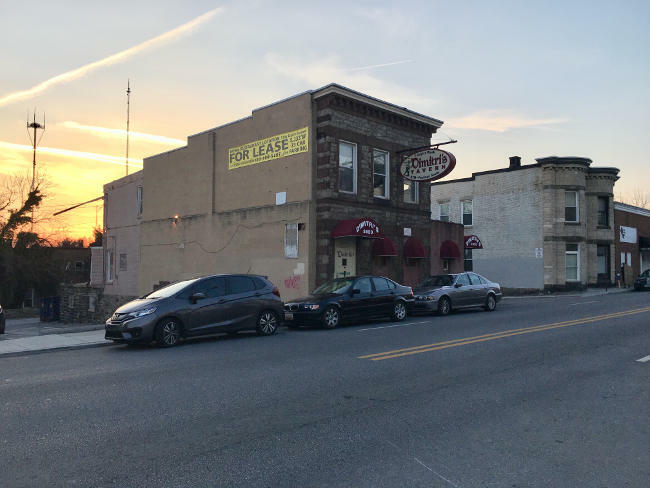 Dimitri’s, our little neighborhood hangout for the Thunderbird and Southern Comfort crowd has shut its doors, and the building’s owners are looking for new tenants. Gentrification happens. Dimitri’s was pretty unapologetic about what it was. Its mascot on the overhead sign there and right on the doorways was a staggering drunk clinging to a lamppost while chugging a bottle. It was a legendary neighborhood dive bar long before I arrived. But if it was a trouble spot I never noticed it. I think I only saw the police there once or twice in the eighteen years I’ve lived here. I see them regularly by the 7-11 on The Avenue. Occasionally they’d have a barbecue in that parking lot next to the building and I’d walk by to the lovely smell of pork on the grill. But it wasn’t good for its clientele. Maybe it’s my Baptist upbringing: when I was a preschooler my bitter Baptist grandmother would take me by the hand as we walked to the grocery store, and whenever we passed by a bar she’d point at the door and say darkly, “the devil lives in there.” I laugh now, but there’s something to be said for that Baptist skepticism of drink. I’ve often told friends back in D.C. that between the crowd waiting for the methadone clinic down by The Avenue to open and the one waiting for Dimitri’s to open, the human decay on display in front of Dimitri’s seemed lots worse. I was so tempted a couple of times to stick my head in there as I walked by. But what am I gonna do? Order a coke and sip it? Someone could spend a few hundred thousand turning it into a….hipster dive.